If you’ve read my bog before you may have noticed I have a tendency to pre-judge products before I’ve eaten them. In truth I’m always hoping to be surprised and sometimes I am, but that is rarely the case. A lot of the time I’m pointing out the absurdity of products such as Peter Andre sauce – which seems to be one of the worst excesses of corporate manipulation. In these cases it’s not about food or quality, it’s about using fame and status to sell products. Of course I’m not naive enough to believe that even when a product is high quality or tastes good that the creator doesn’t want to make money from it, but it does make it more palatable knowing there is mutual benefit. So in a reversal of my usual approach I purchased Fergus Henderson’s Trotter Gear with the expectation that it would be good. Fergus is the man behind the St John restaurants with their iconic pig logo, white washed decor and nose to tail eating ethos. Everything I have eaten at a Fergus Henderson restaurant has been delicious and their eccles cakes are what dreams are made of. So with so much good good will on my part it was all to play for. 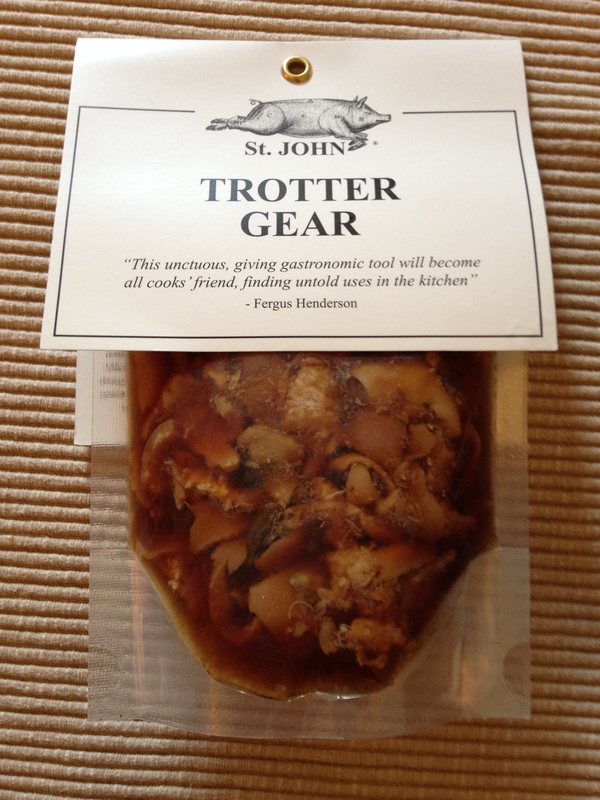 Trotter Gear is essentially a luxury deep flavoured stock created using pigs’ trotters, herbs, vegetables and madeira. The packet says it can be used to “enrich stews, braises and gravies” and it comes with a recipe card for either sausage, trotter and mash or chicken, bacon and trotter pie. I opted for the pie and got cooking. I won’t take you through the entire recipe but jump to the trotter gear stage where the recipe requires the trotter gear to be heated in a saucepan before pouring over the pie filling. I cut open the pouch and it wasn’t particularly pretty – it had more than a passing resemblance to cat food. The jellified, stock and trotters flopped into the pan and started to cook through. As the jelly warmed up and turned to a sauce the flaps of trotter became more evident and the stock became more fragrant. Once liquified it was added to the pie mix and baked in the oven. 40 minutes later a beautiful pie emerged from the oven and I got stuck in. The flavour was delicious adding an intense, salty, meaty depth of flavour to the pie. I know some people get very squeamish about eating the less appealing bits of animals, I’m not one of them and am happy to give anything a go (except eyeballs). This trotter mix would be a great way to sneak some offal into a fussy diners dinner without them knowing. The trotter blends into the mix adding great flavour without worrying people that they are actually chewing on a slippery pigs’ foot. If you have a rustic recipe and are looking to pimp it up with some serious flavour then this is the stuff to do it with. 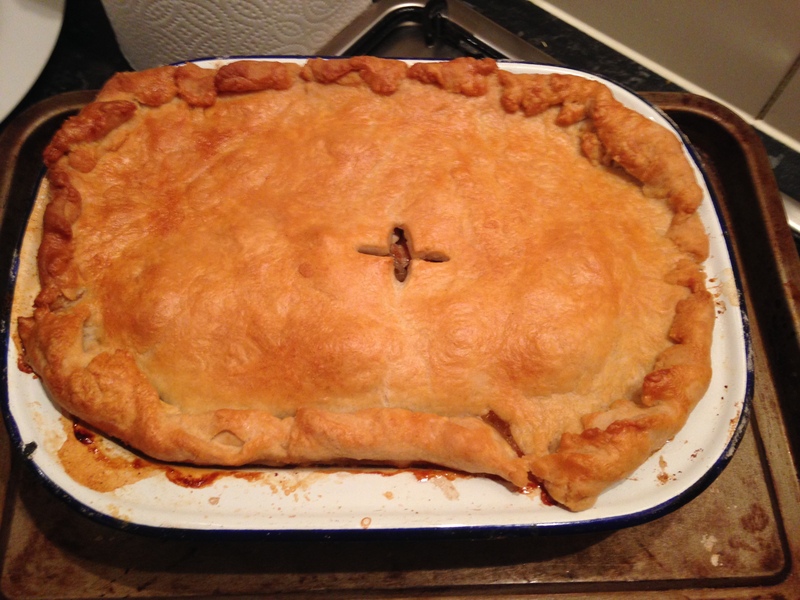 This entry was posted in Uncategorized and tagged chicken and bacon pie, Fergus Henderson, St John, trotter gear. Bookmark the permalink.